Breaking news! I traveled somewhere other than the Walt Disney Resort. It’s true! And while it would’ve been awesome to take a week-long trip to Disney this past August, I expanded my horizons and made a trip up north – specifically to New Hampshire, Canada and Vermont. While it ended up being a welcome and refreshing change, I still was able to enjoy some Disney-like elements specifically while visiting Montreal. On our second day exploring the city, we happened upon the Barbie Expo. It is the largest permanent display of Barbies in the world, and it did not disappoint. It is free and open to the public and so freakin’ cool! Even my husband enjoyed it – going into it he wasn’t exactly sure he would. It was like It’s a Small World, only with Barbies – lots and lots of Barbies, and you walk around at your own leisure rather than riding in a boat. So many of the outfits on the Barbies gave off the Disney Princess vibe as well. That same day we visited La Ronde, which is a theme park located on a small island adjacent to the city. On this island, a World’s Fair-like event took place called Expo ’67 which ran for 6 months with 62 nations contributing. The whole history behind Expo ’67 has always been fascinating to us here at Second Star Sisters, simply because we love anything retro and theme park related. The cool thing about La Ronde is that many of the original attractions still exist and operate today. Unfortunately, the spiral was down that day and a many of the original attractions you have to have a child with you under 12 (everyone spoke French or we would have recruited someone so we could ride). BUT we vow to come back one day with a child so we can ride them, because they looked so cool and cute! The good news is we were able to ride the one attraction that I REALLY wanted to go on – the “minirail“. It was originally 3 different tracks for the Expo and the one located at La Ronde is the only one that still exists today. Now it may seem really simple, but it was just so cool and relaxing! They also did not make you disembark (there were 2 different stations), so we stayed on and did 2 full loops. We could have seriously ridden the minirail all day and been content – we feel the same about the TTA/People Mover in Disney World. There was a section that gave tribute to Expo 67 as well. It had many historical pictures and information, not to mention it was beautifully situated on the water. It was a very peaceful area that we took time to really take a look around. The area pays tribute to La Pitoune (log flume) which was loved by many visitors for over 49 years. It was one of the original attractions at Expo 67 and it was cool to see part of it still set up. Right next door to La Ronde sits the Biosphere which is a museum that focuses on the environment. Unfortunately we were not able to fit it into our trip, but it’s definitely on the list for next time. It’s Montreal’s own Spaceship Earth which I absolutely loved seeing the outside of! The next day on our adventure we hit up Olympic Park – or shall I say Parc Olympique? It was the home of the 1976 Summer Olympic games and it still feels like 1976 when wandering around the property. There’s a whole futuristic-retro vibe which instantly transported me back to Epcot and gave me the Disney fix to keep me fully engaged (I kid, well only sort of). There’s so much to do at Parc Olympique. We decided to take an official tour of the premises as well as ride the cable car to the observatory up top. We had a great time and will definitely be returning here as well to do the Biodome (imagine the Living with the Land ride that you can actually walk through and MUCH bigger!). As you can see I most likely will be returning to Montreal to revisit some favorites and take on some things we didn’t get to do on this trip. At least I know once I do come back, they’ll just be enough “Disney Everywhere I Go” to psych me up! There is nothing more iconic or reflective of Walt in the Disney Parks than the steam trains. Recently, we took the Magic Behind Our Steam Trains Tour at the Magic Kingdom. The tour starts before the park opens, so we woke up early and headed over to park at the Contemporary to be ready for our 7:30 tour. We got there early to enjoy the ambiance of a quiet park entry area. We entered the park before anyone else was allowed in, so we snapped some pictures of an empty Main Street. Our tour guide gave a brief introduction to the tour and then our group boarded the train at the Main Street Station. As we made our way around the park, our tour guide gave us lots of facts and information about the steam trains at the Magic Kingdom. We learned that the four steam trains that make up the Walt Disney World Railroad were built between 1916 and 1928 and were purchased from Mexico. We also learned that the train whistles you hear are actually ways for the trains to communicate. They blow in long/short patterns to indicate different messages, such as the train is approaching, going forward or in reverse, or if there is an emergency. As we passed through Adventureland, we learned that when you go down the hill in Pirates of the Caribbean, you are actually going under the train tracks to the show building on the other side of the tracks. After we pulled in to the Fantasyland Station, the train went in reverse as we headed backwards out of the Magic Kingdom and backstage to the monorail and train roundhouse, the spot where the trains and monorails are maintained and stored. The track actually goes over a public road at a train crossing. We pulled into the roundhouse and then disembarked the train, and were allowed to walk around and explore the area. We learned about the way the steam trains operate using fire and steam. The trains are operated by a fireman (or woman) and an engineer. They work on a rotating schedule and spend 40 minutes as a fireman, then 40 minutes as an engineer, and then spend 40 minutes in a really cold break room (it is really hot up in the cab of the engine). We learned that you must work for 6 months as a conductor before being able to apply to be an engineer/fireman. Despite how complicated everything seemed to us, the training consists of only 8 days! We got to hop up into engine cab to get a close up look at how everything works. We got to see how the steam trains are prepared in the morning for their day in the park. An engineer showed us how they light up the firebox to start up the engine. We also got to see a process where they build up the pressure in the engine really high and it shoots a huge plume of water out of the engine. The shadow going across the street is the huge steam plume! We boarded the train again and rode back into the Magic Kingdom. As we passed the Fantasyland Station (also named the Carrolwood Station after Walt’s home in California), we learned that part of the station is a replica of Walt’s barn in his childhood home of Marceline, MO. We also learned that there are tracks on the ground of Storybook Circus that lead you to different areas of that land. And if your stop at that station seems a little longer than the others, that’s because the water tower on the left is used to refill the steam engine as it makes its trip around the park. When we arrived back at Main Street our final part of the tour was looking at all the details of the Main Street Station followed by a presentation about Walt’s love of trains with lots of wonderful pictures. As with all the tours we’ve taken, we were given a commemorative pin to add to our collections! This 3 hour tour was well worth the price, and as with any tour we’ve ever taken at Walt Disney World or Disneyland, it exceeded our expectations. It was the perfect mix of information about how the trains operate and history of Walt’s passion for trains. We highly recommend it! We recently were at Walt Disney World to celebrate Epcot’s 35th anniversary. While we were very excited to be at Epcot on October 1st, we were equally excited to attend the RetroWDW Podcast’s special event. I have been listening to this podcast since it began about 3 years ago, and they produce excellent content “taking you back to the vacation kingdom of the world; the way it was and the way it is in your memories.” I am a major Disney history nerd, so this podcast is a favorite. When the podcast announced they were holding an event around EPCOT 35, Emily and I were in, and since Mama Darling was buying our tickets (they went on sale while Em and I were at WDW this summer), she decided to buy one for herself too! The event was held Saturday evening at the Living Seas lounge at Epcot. We checked in, got our wristbands, and were ready to go. We had recently visited the Living Seas lounge when we took the UnDISCOVERed Future World Tour, so we knew what to expect. It was really neat seeing how a function operated in this space. We entered the space right near this retro Living Seas logo. 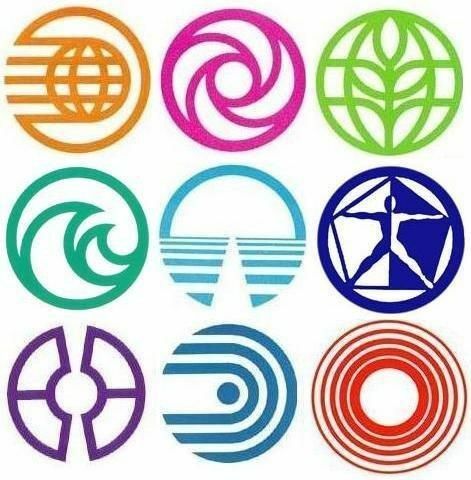 We are really obsessed with the few remaining old school Epcot logos. Shortly before the doors opened, a little less than 200 of us crammed into a tiny holding room. You could feel the anticipation build from everyone around us. Finally, we were allowed up the stairs and into the function space. What immediately caught our attention was a replica cake of Epcot’s 15th anniversary cake, which was made for this event. The event was a lot less formal than official Disney events I’ve attended, but I really liked that. People mingled about the space, ate soft pretzels (yes, our ticket price included pretzels…with 3 different types of mustard!) and cake, gazed out the windows into the giant aquarium and casually hobnobbed with Disney legends. There were some more formal presentations including an intro video based on the original Living Seas video with the original voice actor, a discussion with Corrine Cook, an actor from the Horizons attraction at Epcot, and Disney Legends Tom Nabbe and Bob Gurr. Tom Nabbe has a really interesting story about how he was hired by Walt Disney to play Tom Sawyer on Tom Sawyer island in Disneyland. He worked his way up the ranks and eventually moved to Florida while WDW was being constructed. He oversaw the construction of the monorail beams and stations and later supervised logistics for WDW’s giant warehouses. Bob Gurr is one of my favorite Disney Legends because he designed many ride vehicles at Disneyland (the Monorail, Autopia Cars, the Doom Buggies of Haunted Mansion, 20,000 Leagues Under the Seas Submarines, and Matterhorn Bobsleds). He has said, “If it moves on wheels at Disneyland, I probably designed it.” Bob was actually a surprise guest, and I spotted him mingling among guests before his presentation. My heart nearly stopped because meeting him was at the top of my Disney bucket list. I have seen him give presentations at Disney events and have watched him in videos, and not only is he a legend, he is hilarious, personable, and seems to love young people. I watched him have the cutest interaction with a little girl near the cake. I’m not the type of person to go up and start talking to a legend, but he was very close to me and I thought, this may be my only chance. He was extremely gracious, friendly, and humble and meeting him is something I will never forget. I had a chance to meet Tom Nabbe as well and have him autograph his book. It just was incredible to be able to be up close and personal with these guys. People who worked with Walt hold a special place in my heart, and I feel like the world has less and less of them as time goes on. Also in attendance, which I thought was incredibly cool was Dave Ensign aka Hoot Gibson, who was one of the duo who ran the Mesa Verde Times website that I discussed in a previous post. We also had a meet and greet with a retro Viking Goofy. He did such a nice job with the guests, and he was super entertaining to watch while we waited in line. While the event in itself was worth the price of admission, the guys at RetroWDW organized and orchestrated the greatest gift any old school retro Epcot Disnerd would love. When they showed the video that built up to the surprise, people were losing their minds…..they resurrected (with Disney’s permission) the old entrance fountain prism sculpture at the park entrance. It lights up and changes color! The guys at RetroWDW Podcast threw one heck of an event, and I can’t wait to see what they put together next. If you are interested in checking out their podcast, they can be found here. EPCOT’s 35th Birthday – Here we come! This Sunday, one of our favorite parks – EPCOT – is turning the ripe age of 35 and we couldn’t be more thrilled to be there for it. Per usual, it will be a whirlwind weekend trip with most of our time spent at the birthday park as well as doing some classics in other parks. On Saturday evening, we will be attending one of our favorite podcast’s events – RetroWDW Presents: Looking Back at Tomorrow. What’s really cool is it is taking place in the Living Seas Salon that we got a sneak peek of back in June on our UnDISCOVERed Future World Tour. Little did we know then we’d actually be attending an event there rather soon. We are huge original EPCOT Center fans and we can’t wait to be stuck in a room with other like-minded individuals! We are also planning on catching the ceremony at 10:01 am on Sunday (EPCOT’s actual birthday) at the fountain as well as checking out some merchandise that will only be sold that day. They will be handing out special park guides to commemorate the day as well. In just over 24 hours Emily will be arriving back at Port Orleans Riverside with Mama Darling and Molly will be arriving in just over 48 hours. But who’s counting? Wait…we always are! There’s always something interesting popping up at the Walt Disney Resort, and our Beyond Neverland non-park trips always seem to be enhanced by something “different.” This year we were treated to Christmas in July at Disney Springs. The Market Place side was booming with Christmas music, decorations, shopping specials and free photopass pictures with the big guy himself. It was cool to see him in his summer attire and we even complimented on his hip converse all star high-tops. It was so fun walking around listening to Christmas music blasting. That was probably our favorite part. Even Starbucks got in on the action. We also found something really fun to take home with us, a ceramic Figment! Although it had nothing to do with Christmas in July, we enjoyed a fabulous meal at Wolfgang Puck Express. It’s a nice place to get a quality meal, while still being a quick service restaurant. We enjoyed celebrating Christmas in July at Disney Springs, and, just think, it’s only a few months until WDW starts celebrating Christmas! Something we have always been intrigued by are the Disney Outlet stores. Called Disney Character Warehouse, there are two of these stores in the Orlando area. The larger of the two is at the Orlando Premium Outlets and is only a few miles away from Walt Disney World property. These outlets are official Disney stores and carry discontinued park merchandise at deeply discounted prices. This is something we had always wanted to do, but we could never justify leaving WDW while we were visiting the resort. There is something about leaving Disney property and going back into the “real world” that can be a little jarring. Since we weren’t going to parks on this trip, we decided to give it a shot. From our resort at Port Orleans Riverside, it was about 6 miles away and it took about 20 minutes to get there. Once we arrived at the outlets, we could tell it was really busy because we had to park near the top of the parking garage. The store map had tiny print, so it was hard to navigate, but we managed to stumble upon where we wanted to go. The store indeed was large, and had a wide selection of items. Molly saw the stack of parade cushions, normally 14.95 on sale for 1.99, and picked up a bunch for her classroom. Emily found a cute princess tree that she had been spying last year at Christmas for $7.95 (regular price $30), but upon further inspection she discovered it was really poor quality. There were lots of holiday merchandise, and items from old events such as the Flower and Garden festival that just ended. The majority of the items were priced to sell, such as a whole rack of $5 tee shirts. There was a wide variety of items, and there probably is something for everyone in this store. The line stretched towards the back of the store! In the end, we scored some cool merchandise, including Disneyland 60th lanyards. All of these items totaled $24. We did ask one of the cast members if the crowds we experienced were normal, and she said this was more crowded than usual. It would probably be a much better experience if we went back on a less crowded day, but this is the kind of thing we did once and probably won’t do again. The best part about the Character Warehouse was its proximity to a Starbucks across the way, because we needed some nourishment after that adventure. As we drove “home” in a massive thunderstorm, we laughed and decided we weren’t leaving Disney property again on that trip! When we plan our Beyond Neverland trips, which are trips in which we don’t go to the parks, we try to always stay at least at the moderate level. These resorts have more offerings and since we normally are spending more time there than a regular park trip visit, we don’t hesitate the splurge. We had ideas in mind such as the Ft. Wilderness Cabins and Animal Kingdom Lodge, but when we saw a summer rate for Riverside pop up in our search, we couldn’t pass it up. We love the Port Orleans Resorts! They are so peaceful and laid back, and there’s something so calming about staying on the Sassagoula River. While French Quarter’s theme is New Orleans, Riverside is themed in the heart of rural Louisiana’s southern charm. Both resorts are very close to each other, so we were able to easily walk back and forth in between, as our section was the closest to French Quarter. Upon arrival, we noticed we were upgraded to a “Royal” room, which is one of Princess Tiana’s special rooms in the Mansions section. We particularly enjoyed the “fireworks” above our beds. Emily especially enjoyed running around the property one morning, and happily saw there were plenty of other runners out there with the same idea in mind. Although Riverside has a bunch of nice pools, we never made it due to the weather, but it didn’t damper our time. The ease of getting to and from Disney Springs on the Sassagoula Steamboat was the icing on the cake. It’s a relaxing 15 minute ride from the resort to Disney Springs. When it comes to the moderate resorts, our favorites are by far Port Orleans Riverside and French Quarter! The theming is impeccable, and you really feel like you are getting away from it all!